Reliance has receive multiple inquiries from end-users regarding the practice of engraving metallic hardware and components used in fall protection products and systems for the purposes of assigning asset numbers or other identification or assignment codes to products in service. This bulletin addresses those questions. Details regarding irregularity in sizes of 3022-17 sockets received by Reliance from socket OEM. Detailed instructions for lubricating and cleaning 3011 Rebar Snap hooks that may have become loaded with abrasive debris or other contaminants, resulting in the hook being unable to close and lock properly. Procedure fro removing 2265/66 anchorage connectors that will not release properly. Describes the normal servicing, recertification and inspection requirements for Reliance products. Cleaning procedures for Reliance textile items, including a listing of tested and approved commercial cleaning agents. Reliance position on the service life of Personal Fall Protection Equipment. Clarification regarding the use of “Sharpie” and “Marks-a-Lot” Markers to record information on webbing. Reliance provides unique identification for all harnesses manufactured through the use of the product “Serial Number.” The “Serial Number” allows equipment users to track and maintain critical information about each individual products inspection record, and origin. Describes the procedure used to connect all 400X series SRL devices directly to the harness webbing at the back D-ring location using the 4007-65 Connector. Design update details for the 6077-21 Tie-Back Assembly. 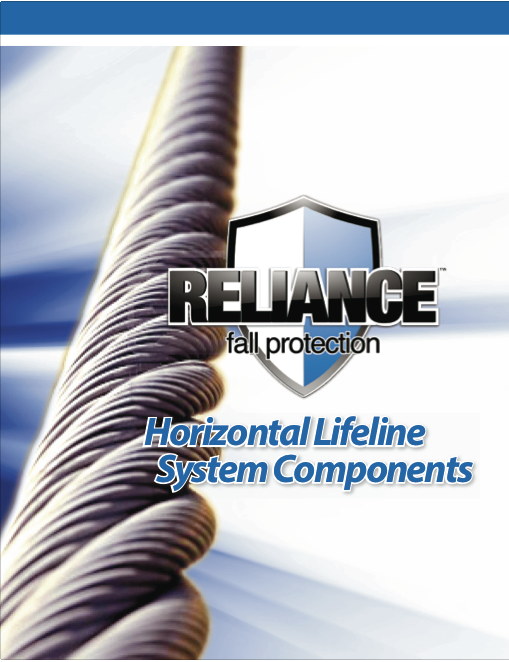 Comprehensive guide to the individual components use in the construction and assembly of Reliance Engineered Horizontal Lifeline Systems. Contains complete descriptions, part numbers, photographs, and drawings. Details regarding the incorrect usage of Shock Absorbing Lanyards as Positioning Devices. Draft copy of updated catalog including many new products and systems. Reliance Industries Self-retracting Lifelines (SRLs) which possess internal brakes that limit the maximum arrest force (MAF) to 900-lb. or less may be used by workers with a total weight of 400-lb. When tested for use in these applications, the arresting force of the SRL remained below 900-lb. with extensions less than 42-in., making the SRLs compliant with both current OSHA and ANSI regulations provided the SRL is mounted overhead. Provides guidance in using the Skyloc II Leading Edge SRLs, as well as how to determine and calculate the minimum required clearance for leading edge falls.